For the SP-1, Russ Andrews took the diminutive Focal 705V and removed its crossover and wiring, replacing them with Kimber Kable 4PR and a single capacitor to form a high pass filter for the tweeter. The cabinet has been damped and the wadding replaced with real wool, (presumably of the Cumbrian variety). The most radical step, though, is the removal of the filter network that usually sits between input and midbass driver - a network that Focal employs to maintain phase between drive units - but as Russ proves, not one that is fundamentally essential to the operation of the driver (which now rolls off mechanically and presumably at a rather higher frequency than it usually does). The fact that he has done this with Focal's blessing is, however, encouraging. It's this change that lies behind RA's claimed increase in sensitivity, from the 89dB specified by Focal, to 95dB; which seems optimistic in the extreme when you consider the volume of the box and the size of the main driver! On the outside, this is a badged Focal 705V - a vinyl-wrapped cabinet with a 100mm polyglass cone midbass unit and an aluminium and magnesium inverted-dome tweeter. It has threaded inserts in the base, a single pair of speaker terminals and a hook so that you can hang it on the wall, should you wish to. Russ supplies specific set up instructions with the SP-1. These suggest placement on either side of the room and close to the back wall. The instructions are comprehensive and even suggesting how far you should place the listening seat from the end wall. Accordingly, we followed the instructions and got a result that would suggest Russ knows what he's talking about. We also used Russ's DAC-1 converter, HP-1 preamp and PA-1 power amp along with a Rotel RCD-06 CD player. What first strikes you about the sound this set-up produces is its scale; the speakers fill the space between them producing an image as wide as the room. 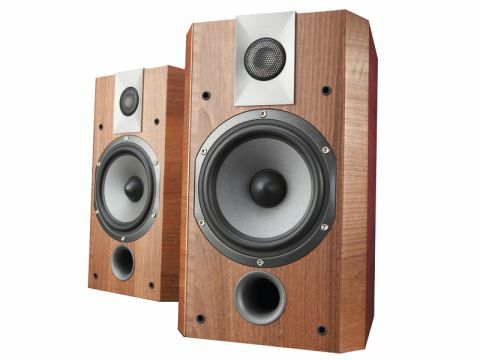 With most discs each speaker also manages to disappear in the process; this is a trick that small speakers find easier to pull off, but these ones do it in impressive style. The image is not, perhaps, as deep as it would be with more space behind the speakers, but the vivacity of sound is a very good distraction from this. The SP-1 has a degree of transient speed that you don't expect at the price, it approaches what can be achieved with single driver designs without the balance compromises that they usually bring. It also makes for highly entertaining listening. This compact system from Russ is one of the most entertaining and affordable we've come across in recent times, and the most powerful. Its quality is due to the immediacy and midband clarity on offer. Although limited, bass extension is good and there's enough to reveal what bass instruments are doing.